This real-money portfolio was first introduced to the Seeking Alpha community in December 2015. 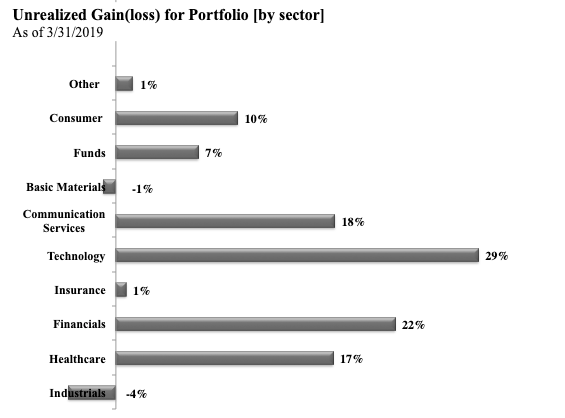 The portfolio underperformed its benchmark in Q1 2019, with several factors being significant contributors, but I believe that the R.I.P. portfolio is properly positioned to benefit from three major trends. The financial holdings were again a major drag to the portfolio's performance but, looking out, the large financial institutions are well-positioned for the next few years. The Retire In Peace portfolio, or R.I.P. portfolio, was first introduced to the Seeking Alpha ("SA") community in December 2015 and I have published quarterly articles that captured the activity and performance of the portfolio since that point in time. The companies that I write about on SA are largely the holdings of the R.I.P. portfolio, so the main purpose for the quarterly articles is to allow for my SA followers to track the performance of the stocks that I write about on this platform. See the article linked above for additional detail on what I would like to accomplish with these quarterly updates. Additionally, the portfolio goals and my long-term strategy are identified in the section below. 2018 turned out to be the worst year over the last decade for the market, and pundits started the new year concerned about a possible economic slowdown. Things changed quickly as the S&P 500 finished the first three months of 2019 higher by ~13% with the technology sector leading the charge. The main factors that had an impact on the market in Q1 2019 were the following: (1) U.S. and China trade talks, (2) the "change" in the Federal Reserve's policy stance, and (3) the inverted yield curve concerns. The trade war talk has created a significant amount of volatility in the market over the last few quarters but, more recently, pundits believe that constructive talks may actually lead to a U.S.-China deal in the months ahead. Personally, I believe that our president's stance on the market being his report card will lead to this administration entering into a trade deal sooner rather than later. The December 2018 25bps interest rate hike turned out to be a mistake, if you listen to the current administration - i.e., Larry Kudlow, a White House economic advisor, recently called for the Fed to cut rates by 50bps. The Fed raised rates four times in 2018 so pundits are surprised, and rightfully so, about the newfound calls for the need to cut rates. Moreover, Mr. Jerome Powell, Fed Chairman, recently added fuel to the fire when he stated that the Fed was in "no rush to make a judgment about further changes in interest rates". While Mr. Powell still called the U.S. economy "strong" (although slowing), his latest comments about the market/rates sounded very different than what he said in December 2018 after the last rate hike. It is hard telling how this all will play out but I would not be surprised if the president got his wishes and the Fed cut rates at some point in 2019. Have you heard yet? 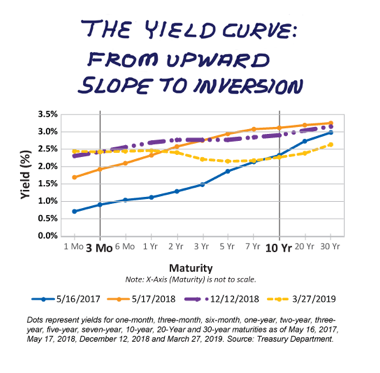 If not, you may want to know that the yield curve inverted in late March 2019. In all seriousness, while pundits cannot exactly seem to agree about the probability of a recession in the near future, it is important to note that some economists believe that this time will be different (remember, yield curve inversions have been an excellent indicator for recessions in the past) due to the fact that other activity indicators are not yet signaling a downturn. Only time will tell; however, I do plan to stay invested even if we have a broader market pullback. Now bringing this all back to the R.I.P. portfolio, I am heavily invested in technology (positive), industrials (positive), financials (negative) and healthcare (negative) so the quarterly performance was pretty much in line with expectations. 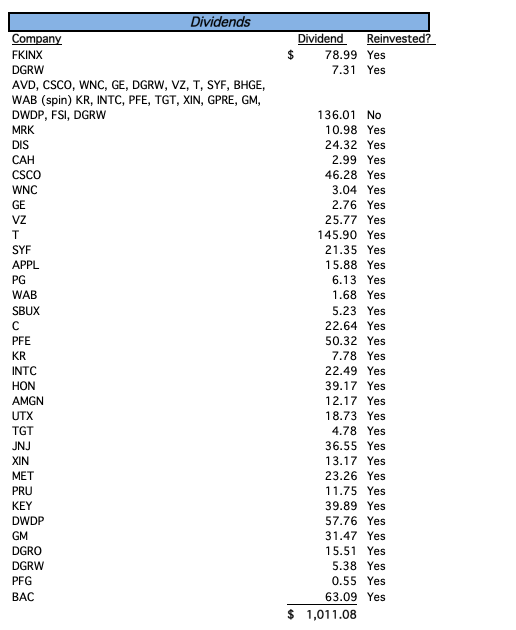 The financial weighting was ~22% as of Q1 2019 (see the Morningstar section below for more detail) so, as you can expect, these holdings were a drag on the quarterly performance. I have been in risk-off mode and repositioning the portfolio since mid-2018 so the next quarter or two should be more of the same, of course, unless there is a major market meltdown. In this article, I will highlight the recent changes to the R.I.P. portfolio and describe how the portfolio performed over the first three months of 2019. I am building this portfolio with retirement in mind, so I have 30-plus years to invest and make adjustments; therefore, the quarterly [and annual] volatility is not a major concern. These funds will stay in the market for the foreseeable future, so the portfolio will have the luxury of compounding for many years. Compound interest is the eighth wonder of the world. He who understands it, earns it... he who doesn't... pays it." -Anonymous. It is also important to note that this is a real-money portfolio. The R.I.P. portfolio consists of five different accounts: a Roth IRA, a Traditional IRA, and three taxable brokerage accounts. These are not my family's main retirement assets, but it is a portfolio that I hope will greatly contribute to a stress-free and relaxing retirement. The Goals and Strategy section was last updated in January 2018. Main Investments (i.e., core holdings) - The companies that are considered core holdings should have established management teams that have proven track records of creating value. Furthermore, the companies should have competitive moats and be above-average operators within the respective industries. The core holdings are mainly large cap companies that are widely held by the financial community and this is by design. Goals & Strategy - The portfolio seeks primarily long-term capital appreciation by investing mainly in equity securities of high-quality companies that have already shown the ability to produce sustainable earnings growth. The portfolio aims to beat the benchmark, the SPDR S&P 500 ETF (SPY), by at least 1% on an annual basis. Missing out on short-term gains and/or having paper losses are not my main concerns, because I plan to stay committed to my long-term strategy of utilizing a bottoms-up investing philosophy to select companies that I plan to hold for many years. *The Other category comprises of speculative investments in companies that have the potential to create outsized gains over the next three-to-five years (what I like to refer to as "investing in seedlings"). The investments within this category could eventually become longer ranged holdings if after further analysis it is determined that the companies indeed have the attributes that I look for. Contributions - I plan to contribute between $1,000 and $2,500 of new capital per month to the portfolio and I typically put the new capital to work each and every month, regardless of the performance of the broader market. 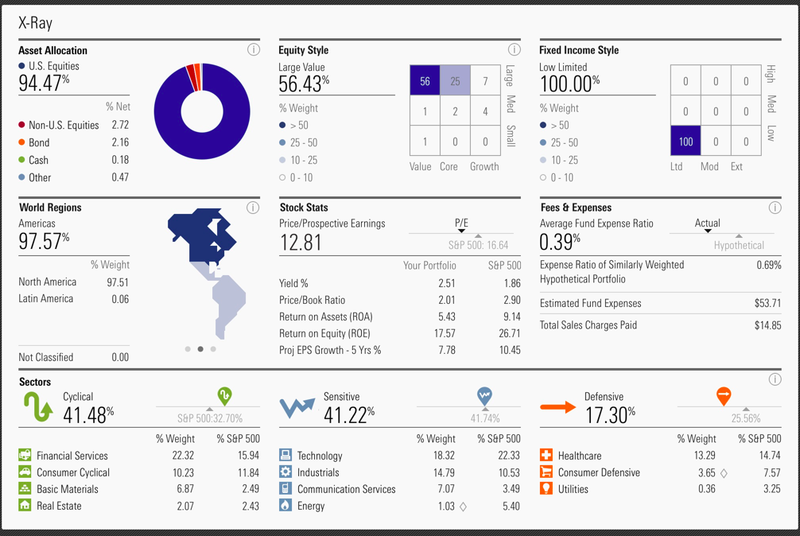 Below you will find the portfolio and its performance, and the activity for the first quarter of 2019. Below is a graphic from Morningstar that captures a high-level snapshot of the R.I.P. portfolio as of the period-end. Full Disclosure: The AIG Tarp warrants are not included in this Morningstar analysis. I do not want to spend too much time here but there are a few data points that should be highlighted: the holdings of the R.I.P. portfolio are attractively valued when compared to the S&P 500 on a price-to-prospective earnings basis but, in the same breath, the portfolio holdings also have significantly lower-than-average ROA and ROE ratios. Moreover, the portfolio's projected EPS growth over the next five years is trailing that of the average for the S&P 500. Lastly, the R.I.P. portfolio is highly levered to cyclical companies and Large Cap value still makes up approximately 56% of the total assets (down from 60% at the end of fiscal 2018). Full Disclosure: The American Association of Individual Investors, or AAii, prescribed calculation (The Beginning Vs. the End) was used for calculating the portfolio's return for each period-end. From an income standpoint, the portfolio's annual dividend income has grown significantly since 2016 (portfolio was first introduced in December 2015). Note: Q2-Q4 2019 are projections based on: (1) expected contributions to portfolio and (2) estimated growth in dividends. The portfolio's dividend income was $1,011 for Q1 2019, which is slightly higher than the previous quarter ($920 in Q4 2018). The portfolio's projected dividend income for 2019 is approximately 28% higher than the total income received in 2018 and this estimate may actually turn out to be too conservative. It should also be noted that I do not have a specific income goal for the portfolio, but I have purposefully focused on investing in high-quality dividend paying stocks since late-2015. Now, for the most important metric, the R.I.P. portfolio has underperformed its benchmark by ~7.5 percentage points since the portfolio was introduced to the SA community on December 4, 2015. 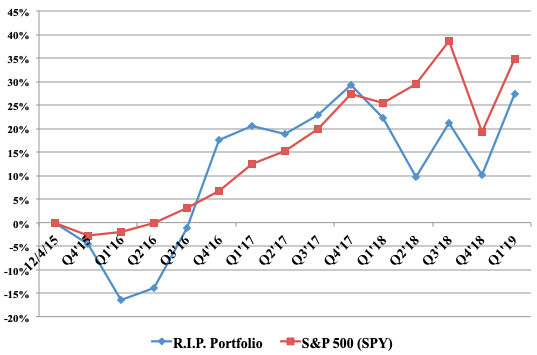 The Q1 2019 performance of the portfolio was what I would consider a slight disappointment (trailed the S&P 500's performance). Moreover, the portfolio went from outperforming its benchmark throughout 2017 to underperforming it since early 2018. There are 2 main factors that contributed to portfolio underperforming its benchmark (let me stress that these are reasons, not excuses): the portfolio has a value-tilt and is overweight financials. See my full-year 2018 article for additional detail on these contributing factors. During the most recent quarter, the top performers and under-performers for the portfolio were: Performers -  Cisco,  Bank of America, and  Honeywell; Under-performers -  Fifth Third,  Kroger, and  Pfizer. I consistently write about all of these positions so please see my current thoughts on each company/stock at my Seeking Alpha profile. Intel increased its quarterly dividend by 5% (from $0.30 to $0.315), which brings the forward dividend yield 2.4% based on today's price. Prudential Financial increased its quarterly dividend by 11.1% (from $0.90 to $1.00), which brings the forward dividend yield 4.3% based on today's price. Cisco increased its quarterly dividend by 6.1% (from $0.33 to $0.35), which brings the forward dividend yield 2.6% based on today's price. Additionally, the board added $15B to the company's buyback program which brings the total available to $24B. General Electric completed the asset merger with Wabtec and formed a new Transportation company. I am long the newly created Wabtec and I plan to stay long the stock. Johnson & Johnson agreed to acquire robotic endoscope developer Auris Health for $3.4B in cash. This small acquisition is not enough to move the market but I like the business prospects of Auris Health being folded into JNJ's business portfolio. the changing media space, which includes how companies will be structured and how content will be consumed by/distributed to customers. Media Shift - Disney, Twitter, AT&T, Facebook, and Verizon. I am looking forward to 2019 and what the next few quarters may bring. I have been in risk-off mode since mid-2018 and I believe that it will pay huge dividends over the next 18-24 months. While the broader market may not rise as much as some experts are calling for (for example, Wharton's Jeremy Siegel predicted that the S&P 500 will return 5%-15% in 2019), I do believe that equities will post solid returns over the next four quarters. The portfolio's value-tilt, including the heavy investments in the financial and healthcare sectors, have been out-of-favor for awhile now but I believe that it will be a different story as we head into 2020. 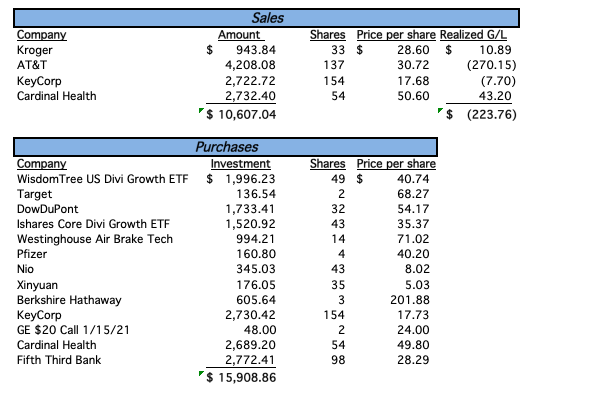 Based on my internal valuation work, I believe that the following two positions will have the greatest impact to the portfolio's out-performance in 2019:  DowDuPont - as I recently described, the spinoffs (i.e., the company will split into three separately traded entities over the next year) will create a significant amount of shareholder value, and  Bank Of America - this bank is attractively valued and its capital return story, as I previously described, should help propel BAC shares higher in 2019 and beyond. Peter Lynch - "Behind every stock is a company. Find out what it's doing." Warren Buffett - "Successful investing takes time, discipline and patience. No matter how great the talent or effort, some things just take time..."
Disclosure: I am/we are long KR, SBUX, SYF, TGT, FKINX, DGRO, DGRW, T, VZ, DIS, HON, UTX, GE, BHGE, DWDP, MET, BHF, PFG, PRU, BAC, KEY, C, FITB, BRK.B, TWTR, FB, GM, PG, AAPL, INTC, CSCO, ACN, MRK, CAH, JNJ, WAB, NIO, Z, TSLA, TDOC, CRL, MTZ. I wrote this article myself, and it expresses my own opinions. I am not receiving compensation for it (other than from Seeking Alpha). I have no business relationship with any company whose stock is mentioned in this article.